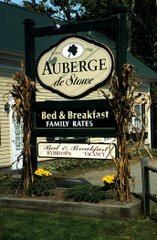 Not just another innkeeping blog, Innkeeping Innsights in Stowe explores the experience of Auberge de Stowe innkeeper Shawn Kerivan, including his other lives as a writer and a teacher. I opened a letter and a check fell out. It was a book order, someone who wanted to buy my new book, Name the Boy. I signed a copy, slipped it into a mailer, and headed out to the post office. Before I handed the envelope over to the postal clerk, I made sure I scribbled "Media Mail" across the front, ensuring the most economical form of postage. The clerk looked at the envelope and said, "Media Mail, huh? Is there anything of a personal nature inside, like a letter?" I immediately said no; there was nothing inside except my book. But as she weighed the envelope and applied the postage, counting out my change, I blushed with guilt, because I knew I'd just lied. Name the Boy was a book, a collection of short stories, and decidedly fiction, but the work itself was intensely personal. Despite my protestations to the contrary, despite the disclaimer in the front of the book saying "This is a work of fiction. Any resemblance to any character in this book to any person, living or dead, is purely coincidental," I knew otherwise. When I was at Goddard College pursuing my MFA, I had to write a long critical paper. For the subject, I chose to look at the literary relationship between Charles Dickens and John Irving, and then to compare that relationship with Irving's influence on my own writing. While researching the paper, I discovered a wealth of information about Irving's struggles with the loss of his own father (he was adopted by his mother's second husband, and he took that name--Irving). When my paper began to focus on Irving's seeming avoidance of the subject of his father, my advisor cautioned me against letting the paper become a "gotcha!" quest. But what I discovered was the intensely personal relationship between an author and his work. With Irving, I could see the longing for the relationship with his father appear in his writing. I didn't have any proof; as a son who also longed for the same thing, I recognized the elements in the writing. I knew that anything I wrote, anything I fictionalized, would still be of a personal nature. I couldn't explain this to the postal clerk--I didn't want to make her "go postal." So I kept my little lie to myself, and watched my bubble wrap-covered tome of intensely personal material get tossed into the mail bag, and sent off into the world. It was like an old girlfriend calling you up and telling you've got a nineteen year old child who wants to meet daddy. Or buying a new car after a painful negotiation. I'm talking about Name the Boy, my book, which has just been published by Dan River Press in Thomaston, Maine. The short story collection that didn't seem like it would ever be, finally is. And what a ride it's been. If you're really interested in the whole topsy-turvy experience I've been through over the past three months, read my upcoming article in the Stowe Reporter. But for now, I just want to reflect a little on what's to come, and it seems like that's going to involve some selling. The good news is that I've made my first over the counter sale already, to one of the guests who stayed at the inn this week. For those of you that can't make it up to Stowe, you can still buy a copy of Name the Boy online at my website, www.shawnkerivan.com. But for those of you who can come up to Stowe within the next week or two, I've got a treat for you. Actually, the Mountain has a treat for you: several feet of fresh snow. I don't know how it happened, or why, but we're suddenly blessed with endless dumps of snow. For the last couple of weeks, we've been finishing our Sunday afternoon skiing in 50-degree spring conditions, saying to ourselves, "That was the best day skiing ever." Well, we did it again this morning. Every Easter there's a sunrise service on the Mountain, at the top of the gondola. This morning there was also a blizzard at the top of the gondola. The skiing that followed the service was indescribable. Not only did I not see my skis, I never saw my boots as I drifted down through the powder. So grab your boards and get up here this week. I'll send you home with some great memories and my new short story collection, Name the Boy.